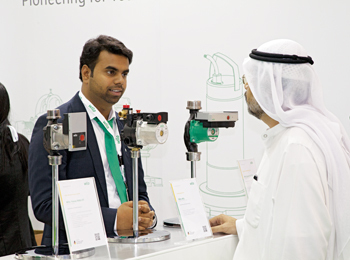 The new pump – Wilo Initial Peripheral – can run on suction from a little deep well, a tank, a cistern or on load, according to Fouad Ahmed, marketing manager, Wilo Middle East FZE. The German company’s most popular products in the Middle East include booster sets, CronoNorm-NL, horizontal and vertical multistage pumps and drainage and sewage pumps such as Drain MTC and FA. “Our submersible mixers are also doing very well in this region,” says Ahmed. Commenting on the factors behind the success of Wilo products in the Middle East, he said: “In order to maximise the efficiency of buildings, it is becoming increasingly important to use innovative and energy saving systems incorporating components that are optimally matched to one another. Whether it is detached and semi-detached dwellings, public buildings, industrial complexes, office buildings, hospitals or hotels, Wilo offers energy-efficient solutions for heating technology, air conditioning, water supply and waste disposal systems. Wilo’s main markets in the Middle East are the UAE, Saudi Arabia, Qatar, Egypt and Iran. It also serves Kuwait, Oman, Bahrain, Iran and Yemen. The company has offices in Riyadh and Cairo to support its customers in terms of sales presentation, follow-up, technical back-up and after sales service. Its markets in Qatar and Iran are supported by country sales managers located in Doha and Tehran. In Kuwait, Oman, Bahrain and Yemen, Wilo sells through local distributors. Wilo products are mainly used in the construction sector – residential and commercial buildings. Its customers include municipalities. One of its top references in the Middle East is the Dubai Metro project. “We supplied around 500 pumps for chilled water/air-conditioning, water boosting, water transfer, the sewage system, dewatering and foul water drainage and pressurisation units. We have recently been awarded the Dubai Tram project,” Ahmed said. 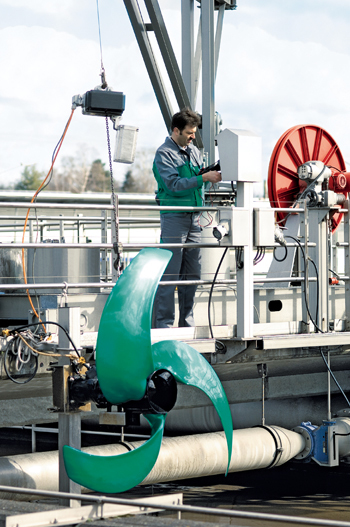 With the growing application of new building technologies and the introduction of high-efficiency pumps, the customers’ needs for technical support and service become more urgent. This prompted Wilo to have a direct presence in the region. It oppened the first Middle East office at Techno Park, Dubai in 2006. In 2008 the company moved to the Jebel Ali Free Zone, Dubai, where it became the Wilo Group’s headquarters for the whole of the Gulf region as well as for Egypt, Yemen and Iran. In 2011 the company started assembling booster pumps locally. The move has enabled Wilo to provide customised pumps to the end-users and is also able to achieve lead time and deliver consolidated parts. Wilo also offers pre and post-installation, commissioning and technical support through a dedicated and specialised technical team. “Our technical team is able to assemble pressure boosting systems as per customer specifications and Wilo standards. Wilo Eco booster sets assembled in the Middle East facility are characterised by the highest comfort and low power consumption,” remarked Ahmed. He further said: “Pumps are generally high power-consuming products. We are focusing on developing products which protect the environment by saving energy. We see ourselves in a unique position. We did very well and achieved our set target in 2013 and we are looking for more success in the region, especially since all eyes are now concentrated on Expo 2020 in Dubai and the World Cup 2022 in Qatar and on markets such as Saudi Arabia, Egypt and Iran that offer great business opportunities. “Improving energy conservation is our major direction ahead along with new product innovations. We see the East and Middle East region as the most promising market in the coming years,” he added.